The last few months have been insane at my place, as I finally moved to the condo that I bought. I lived at the old place for over ten years, so you can imagine the hidden mess and dirt lurking underneath and behind old furniture. I'm a fairly clean person, but there was a few pieces of furniture that was too difficult to move on my own to clean... which meant that it only got cleaned once a year for spring cleaning. I'm the type of person who likes to clean on a daily basis, or at least every other day, and have an addiction for lemon cleaners. The problem with everyday cleaners, is that they're filled with chemicals, and not exactly baby friendly. Since the move, I find myself cleaning half a dozen times a day... my toddler keeps me busy! Using harsh chemicals a few times a day isn't what I want for my family, which is why I recently discovered e-cloth. They're items that you clean with using only water, and are more ideal and safe for daily use. The best microfiber cloths on the market have between 90,000 and 200,000 fibers per square inch (MOST cloths being sold only have 25,000-75,000). e-cloths have 3.1 Million fibers per inch. Why are fibers important? The cloths are made of polyester and nylon, so they don’t “absorb” anything. Water, dirt, oil, grease, grime and even bacteria are trapped within the fibers – so the more fibers you have the better the cloth works. Think of it as millions of tiny hands grabbing onto everything on the surface of your counter-top or sink. A surface cleaned with an e-cloth is free of two potentially harmful things: cleaning chemicals and bacteria. One of the scariest things ever written is this excerpt from a Columbia University College of Physicians & Surgeons study: “Women who work at home have a 54% higher death rate from cancer than women working away from the home.” A 15 year study concluded that it is directly linked to the toxic household chemicals in the home. 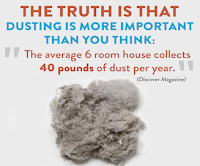 The National Research Council reports that “No toxic information is available for more than 80% of the chemicals in everyday use products.” Not only do you not know what chemicals you're exposing your family to, there isn’t a way to find out. 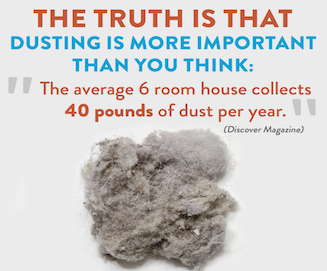 These chemicals leave residue on every surface of the home. Eliminating them is good for you and your family. We all know why it’s important to get rid of bacteria, but the chemicals we’ve been using to kill them might be just as harmful to us. I was sent the e-cloth Kitchen Pack, which contain 2 cloths. It was in a package like the one in the picture above, but I wasn't able to snap a photo before that portion was tossed... my hubby opened it before I had a chance to take the photo. I know it was the same packaging as above, since I was the one who opened the mail before heading to work that day... never in a million years did I think he would actually start cleaning with them on his own! One of the clothes was greenish in colour and was thicker than the other. It was soft and absorbent with a rough texture on the corner. The other cloth was thin and smooth, with one of the side super smooth like silk. The green one was perfect for scrubbing things around the home, whereas the thin one was perfect for windows and stainless steel. 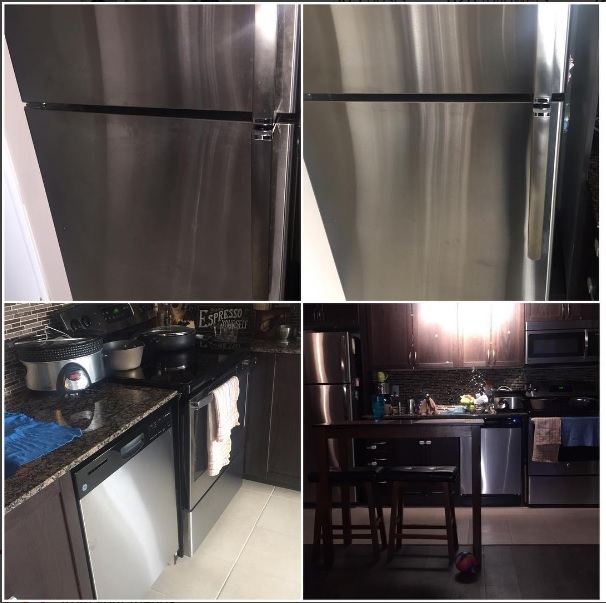 See the photos below... the left picture of the fridge is before it was cleaned, and the right one was after. For just a quick clean, it took care of the stainless steel pretty good. Nothing else really works to remove the oil from fingerprints, and most stainless steel cleaners are expensive and chemically filled. The cloths are excellent for stainless steel and granite surfaces. To clean a surface, just wet the cloth with water and have fun cleaning. Once you're done, just wash it in the sink with warm water. Once it's been used a few times, just toss it in the laundry with your other towels and clothing. Interested in getting some cleaning products for yourself? Of course you are... they're affordable. Click here to grab yours today. Interested in checking out their Facebook and Twitter? Of course you are... you never know when you could come across a deal! 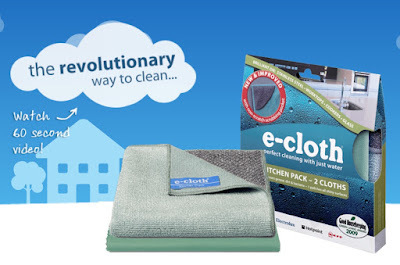 One lucky reader has a chance to win a kitchen set of e-cloth's! To qualify, you must be a resident of the USA or Canada, and over 18. I'd like to win because I am a paid housekeeper. I always am looking for things to help make my job easier and faster.